Retail $6.50 SAVE 24% ! If you need fast and smooth control for your turn-outs (switches) these are by far the best. With the touch a of the button in either direction your HO or N scale trains will get right on track every time! Be sure to follow the wiring directions to the letter or you will have problems as these wire directly to the AC Accessory panel on your transformer. Link them in as many as you need for a constant control for as many turnouts as you have. 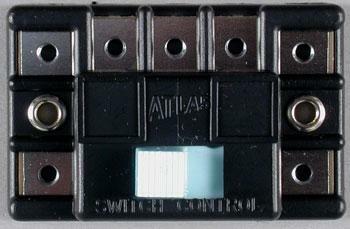 Controls Atlas (or other twin coil) switch machines with SPDT momentary action. Button position indicates turnout setting. Can be coupled together in any number without wiring. You may connect additional switch control boxes. Detailed illustrated instructions provided on package. Just what I needed for my turnouts. Easy to wire and use. A good quality part.